Quality ingredients, timely delivery, professionalism and now technology too. Thanks to this App, Pizzeria IL MORECCIO provides the opportunity to order your favourite pizza in the most convenient way. Thanks to our “points” programme, you’ll also be able to spend less. Always have our contact details on hand. 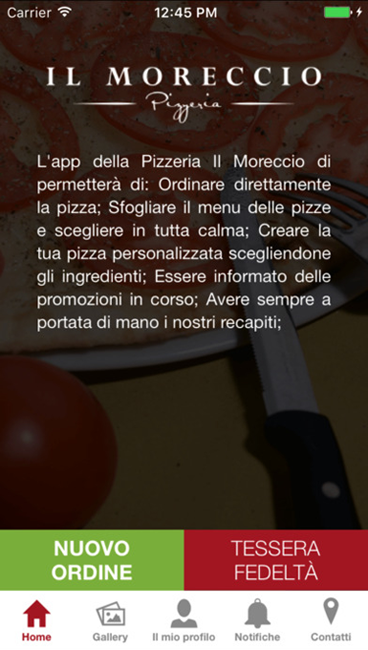 Our app is integrated with the pizzeria’s internal management. This basically lets you interact directly with us. Management does not accept more orders than what we can actually produce… this translates into a delivery time guarantee and a hot pizza for you, right when you want it.